HP Umpire Jim Reynolds ejected Brewers Manager Craig Counsell (Replay Review; upheld out call) in the bottom of the 6th inning of the Diamondbacks-Brewers game. With two out and two on (R1, R3), Brewers baserunner R3 Eric Thames attempted to score on a curveball in the dirt from Diamondbacks pitcher Zack Godley that eluded catcher Chris Iannetta, who retrieved the ball and threw to Godley covering as Thames arrived at home plate. Upon Replay Review as the result of a challenge by Brewers Manager Counsell, HP Umpire Reynolds' out call was affirmed, the call was correct. 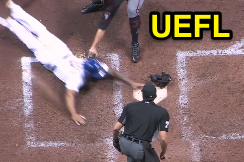 At the time of the ejection, the Diamondbacks were leading, 1-0. The Diamondbacks ultimately won the contest, 4-2, in 10 innings. This is Jim Reynolds (77)'s first ejection of the 2017 MLB regular season. Jim Reynolds now has 2 points in the UEFL Standings (-2 Previous + 2 MLB + 2 Correct Call = 2). Crew Chief Jim Reynolds now has 6 points in Crew Division (5 Previous + 1 Correct Call = 6). This is the 49th ejection report of 2017. This is the 27th Manager ejection of 2017. This is Milwaukee's 2nd ejection of 2017, 2nd in the NL Central (PIT, STL 3; MIL 2; CHC, CIN 0). This is Craig Counsell's first ejection since September 21, 2016 (Jerry Layne; QOC = U [Fair/Foul]). This is Jim Reynolds' first ejection since August 3, 2016 (Corey Kluber; QOC = Y [Out/Safe]). Wrap: Arizona Diamondbacks vs. Milwaukee Brewers, 5/26/17 | Videos via "Read More"